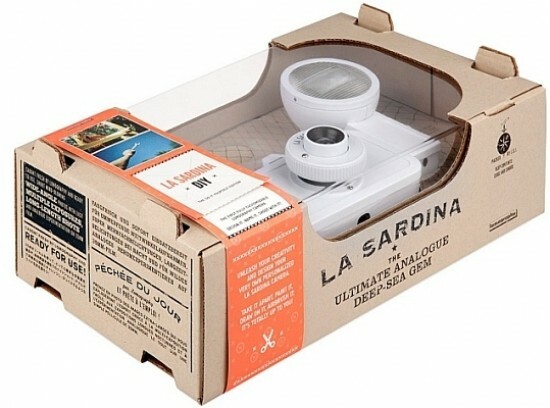 The Lomographic Society has announced the La Sardina DIY Edition. “The La Sardina DIY is a canvas to be filled,” says Heidi Mace, Digital Marketing and Online Manager, Lomography UK & Ireland. “Its interchangeable panels and special ink permeable material provide endless design possibilities. Writing, drawing, painting, or gluing something – it’s just so easy to set creativity free on this analogue icon.” As seen in the photo above, the La Sardina DIY Edition (£99) comes with Fritz the Blitz, a flashgun designed specifically for this analogue camera. The La Sardina is a fashion queen. Wearing the latest trends, colors or patterns, this cute little camera is not only a wide-angle wonder but also a big chunk of eye candy. Now anyone can go crazy with the new DIY Edition. Designed or un-designed, it becomes a personal piece of art which can be transformed in any way. The La Sardina DIY is a canvas to be filled. Its interchangeable panels and special ink permeable material provide endless design possibilities. Writing, drawing, painting, or gluing something – it’s just so easy to set creativity free on this analogue icon. The camera comes with a set of white panels for you to customize and design freely. The kit also includes a set of transparent panels to affix multimedia materials on the body (photos, textiles, stickers, etc.) and a cute little screwdriver which enables it to be taken apart. Matching the camera with the wild pictures it captures has never been easier.